After a much appreciated Easter break, it was back to business as usual for Rockstar Energy Racing as the east coast series returned to Texas. The team was treated with the nicest weather thus far this year and all were eager to get back to racing. Houston is always a favorite stop for the team as well, as Head Technician Jamie Ellis' father comes out to do some good old fashioned Louisiana cooking. Everyone happily stuffed their faces in between every practice, excited for the nights events to come. The weekend off came at a very convenient time for Davi Millsaps as he was just beginning to get back close to 100% after the knee injury he sustained a few weeks prior. After a great ride in Toronto with a 2nd place, he really wanted to back that up with another podium. That just wasn't in the cards unfortunately. Davi's customary good starts were not present this weekend in Houston. He was forced to come through the pack in both his heat race and the 450 main event. His heat was actually a very impressive ride as he came from well outside the top ten to catch all the way up to 4th in the short 8 laps. He wasn't as far back in the pack after exiting the first turn in the main but the result was similar. He was only able to muster a 5th. There is nothing wrong with getting a top 5 in the 450 class however. Things just aren't the same as they used to be where a couple fast guys could start anywhere mid pack and come back for the win. Starts are more important than they've ever been with the level of competition on the line each week and 5th is a positive result any way you look at it. Blake Wharton left the Canadian Supercross with what could be considered a disappointing podium finish. Although he finished 3rd, he was much faster than that and very capable of pulling off the win there. He entered the week off with a slew of advice from all his supporting cast and knew what he needed to work on. Throughout the day in practice, it was not apparent that he had located the improvements he needed. Blake was a bit frustrated all day. Things began to make a turn for the better once racing started as he completed a solid heat race. Shortly after the 250 main event start, Wharton made his complete u-turn. The first lap was the best one he's ridden in 2013, quickly dicing passed several riders to get out front. He then engaged in a heated battle with Marvin Musquin. The Frenchman briefly moved past Blake to take over the lead position. Wharton immediately fired back aggressively putting himself back into first place. He managed to lead the rest of the entire affair, thwarting multiple pass attempts by points leader Wil Hahn. It was a very exciting and heart pounding race for all viewing the battle. The checkers waived and Wharton bested his competitors for his first win of the season. The team will head to Minneapolis next weekend as the series returns to Minnesota after several years off the schedule. 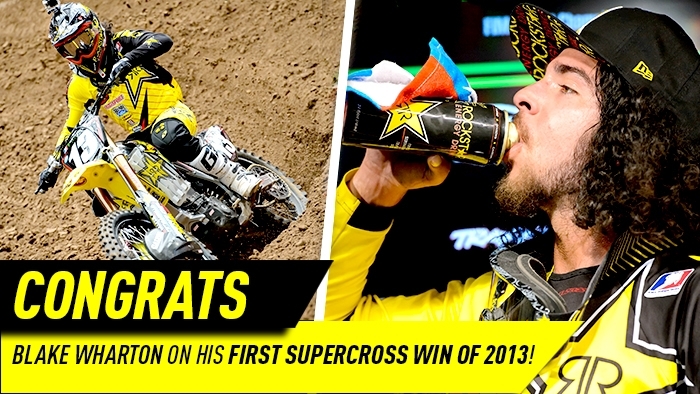 Millsaps will most certainly continue his consistency and strive to return to the podium. Wharton will hit the track full of confidence after his win and recent podium streak. Minneapolis will be the last east coast round before the west coast series returns the following weekend.